Hanoi, Vietnam - We have been in Hanoi for a couple of days now and slowly getting over the culture shock. I thought that Tokyo was a "loud" city but Hanoi is crazy. The constant honking of horns and incessant traffic, this place is crazy! Crossing the street is a challenge in itself as there are virtually no stoplights and even the ones that are there are mostly ignored.The way to cross the street is to just step out and move at a constant pace and let the motorbikes, scooters and cars avoid you. Believe it or not after a day or so you do get the hang of it but the first couple of times are not for the faint of heart. I am glad we came to Hanoi but I can't say its a particularly pretty city or has a lot of sights. I think after two weeks of traveling and constant cities (Tokyo, Singapore, Hanoi) we are ready for a more rural or quieter setting. 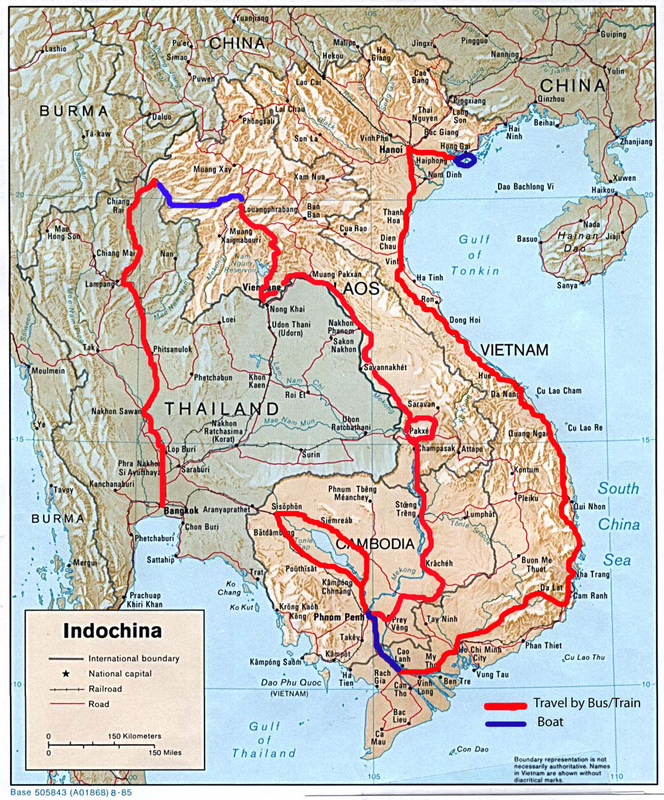 Tomorrow we head to Halong Bay which is about 3 hrs from Hanoi on the coast where we embark on a 3 day cruise around the bay. Halong Bay which has been designated as a UNESCO World Heritage site is famous for its limestone karsts that jut out of the ocean. It should be very peaceful and beautiful for a few days. One of the other interesting things about Hanoi is every morning between 7:30-8am and in the evening between 4:30-5pm loudspeakers around the city blast out the latest government edicts, news and play the national anthem. It is quite funny though it gets a little annoying. Just an FYI that we will be posting more pictures soon. We didn't take a lot of pictures in Singapore or Tokyo as there are only so many city pictures you can take but we are taking more in Vietnam and they should be up soon. SINGAPORE, Little India - While Stacy ducked into an air-conditioned mall, I headed to the Little India Arcade. The salons there are known for their Henna painting they do for the local brides. 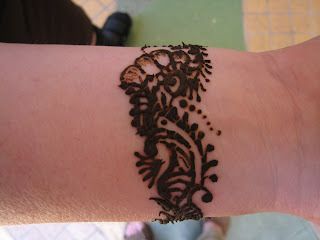 Typically they cover their hands, arms and feet in these intricate designs that are all done by hand. I didn't take it quite that far....just had a bit done around my wrist. The paste that they use has to sit for at least 30 minutes. 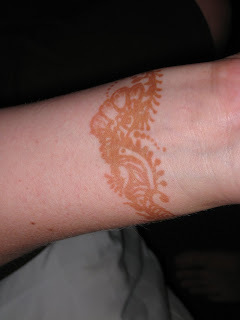 Here are photos of the Henna tattoo with the paste still on and after I wiped the paste off. In Singapore it's all about the food! This is definitely one of the great food cities in the world and we have been doing our best to experience as much of the cuisine as we can. We've settled into a bit of a routine now. We wake up about 8 and meander out of the hotel to get some breakfast around 9. Breakfast consists of a coffee which isn't cheap here and a pastry or pastries. Once we are done with breakfast we have to start planning for lunch. So far we've hit most of the major hawker sites. A hawker market is a collection of stalls usually outdoors but covered that serves up any number of dishs. Each hawker generally specializes in one or two dishes and there are separate stalls for beer, juice, desserts. Basically it is a really good food court! Most of our lunches and dinners then have been at hawker markets as they offer the best value, often the best food and are where the locals generally go to eat. Last night however we decided to hit Little India and try one of Singapore's specialty dishes, Fish Head Curry. It was very good and there is a surprising amount of meat on a fish head. We didn't eat the eyeballs or tongue (as many do) but we did pick it surprisingly clean as you can see in the picure. Tsukiji Fish Market is the largest in the world. It is famous for its tuna auctions however those are at 5am so we weren't going to see those. We did however get an early start and hopped on the metro to the market about 7am. It is without a doubt the largest market either of us have ever seen with all different kinds of fish, crabs, and shrimp. The highlight of the market is the giant frozen tuna that the workers are carving up. These things are massive, 2 feet in diameter and 4-6 feet in length. Restaurants in Tokyo pay tens of thousands of dollars for the perfect tuna. Workers are running around, tourists are snapping pictures trying not to get in the way and trucks are coming and going continuously. You definitely have to be paying attention as you wander around the market. One of the interesting things that Betsy noticed was the little enclosed wooden cashier stands at the back of most of the stalls. Each was occupied by a little old lady who handled all the cash. The men worked in the front of the stall and women were entrusted with the cash. Just like home isn't it? A few words to describe Tokyo are “a cacophony of sounds”. We took a walk through Akihabara which is the “electronics” area of Tokyo. It is a continuous stream of electronics shops each specializing in certain items. Everything from cameras to cable to transistors are sold. All of the stores have garish banners plastered across them and many have young women in the company colors standing out front yelling into a microphone extolling the virtues of their products over those of their competitors. We also browsed the world's largest electronics store, Yodobashi. Picture your average Best Buy with 6 floors instead of 1, and 5x the merchandise packed onto each floor and that is Yodobashi. They have hundreds of laptops, hundreds of cellphones, hundreds of headphones...you get the picture. Even inside Yodobashi they have girls yelling into microphones trying get you to buy their products. So Betsy like most young girls went through a phase where she loved horses. Tonight she renewed her love for horses only this time it was the horse she ate at dinner. Yes horse (see pic left), and not just any horse but raw horse or as the Japanese call it "basashi". We met up with my cousin Kevin who's lived in Japan 10 years and he was kind enough to show us around Tokyo today as well as answer all our questions about the country and its people. Later we went out for dinner with him to a place that was almost like a tapas bar in that you ordered many small plates to be shared. We ordered about 10 dishes including tuna sashimi, yakitori (Japanese version of sate, in this case chicken with leeks), cold soba noodles, korean style omelet, gyoza (potstickers) and a sashimi plate that contained many items we had never had raw such as calamari, shrimp, octopus, scallops. The highlight though was the horse meat. It was sliced thin and was completely raw, you dipped it in a chive/garlic/ginger soy sauce. It was very lean with a little chew to it but very nice. It was so good it was the only thing we ordered a second helping of. Of course this was all washed down by copious amounts of beer and sangria. A great meal and a great night, thanks Kevin! I wasn't sure I'd be saying that this time last week. After finishing up our contracts Betsy and I decided to head to Park City to do some skiing/boarding for a few days before we headed off on our trip. Apparently that wasn't the wisest idea as last Monday while Betsy was taking a snowboarding lesson she caught an edge and broke her ankle! So after being shuttled down the mountain by the ski patrol and taken to the emergency clinic in Park City for x-rays we were relieved to hear that the break was about as minor a break as could be, a barely visible crack in the tibia. So Betsy is not in a cast but is in a walking boot for the next few weeks. Being the trooper she is and the fact she is walking without much discomfort all systems are go for takeoff next Wednesday. Other than that we are just busy running around getting our affairs in order before we leave.